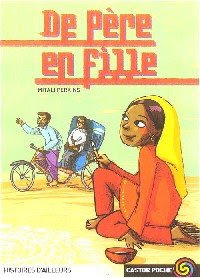 Yes, that's my little Rickshaw Girl, the French edition, aka De père en fille, releasing this month from Flammarion. How children’s literature of the South Asian diaspora responds to the media’s vilification of South Asian minority groups following the 11 September attacks. Immediately following the World Trade Center and the Pentagon attacks on 11 September 2001, the international news media was gripped by the events that took place. However, not only did the news media respond to these events, but other forms of cultural media did too: the music industry, the film industry, the books and literature industry which also includes children’s literature. Examples of children’s books which engage with these events include, amongst others, Jeanette Winter’s September Roses (2004), Randa Abdel-Fattah’s Does My Head Look Big In This? (2007), and Brian Mandabach’s Or Not (2007). But more specifically from the South Asian literary sub-genre of children’s literature: Anjali Banerjee’s Looking for Bapu (2006), Marina Budhos’s Ask Me No Questions (2006) and Mitali Perkins’ First Daughter: Extreme American Makeover (2007). Engaging with media theory and the representations of South Asian minorities since the events of 11 September, this paper will focus predominantly on Perkins’ First Daughter and Budhos’ Ask Me No Questions. Through the characters, this paper will look at whether or not they internalise the stereotypical images and messages purported in the news media, and will ask, firstly, if there is an internalisation of the media stereotypes, why is this possible? And secondly, if there is a resistance towards these media stereotypes, what do these literatures say about young developing ethnic identities and subsequently the individual’s right to negotiate their own ethnic identities? By focussing on these questions, this paper will argue that although these texts present their readers with characters who are confronted by the media and its use of stereotype during its coverage of the 11 September attacks, these characters’ ethnic identities are not compromised, in fact, they are able to remain culturally neutral. Subsequently, through the characters’ experiences, these books are able to offer South Asian diasporic children and teenagers a form of bibliotherapy as these books demonstrate how the characters deal with the negative media pressures. Now that's nice, especially with Boston already greening up for St. Patty's Day.